TV must be set to channel 3 or 4. Use RF Coaxial cable RG-59 or RG-6. Video and Audio carried combined on coax cable. 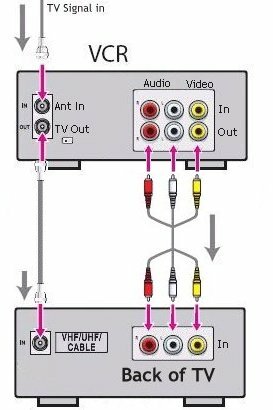 TV must be set to LINE Input for stereo sound from VCR. If you have powered on the VCR and the TV, connected your cables and tuned the TV to channel 3 or 4 if using RF cable, you can now press the MENU or PROG button on the VCR remote. Some VCRs have a EASY-SETUP button. Most VCRs want you to select your LANGUAGE before anything else. After that, many VCRs also want you to set the proper time of day (CLOCK) before you setup channels or any advanced options. Select from the on-screen menu (seen on the TV screen) SET CLOCK or equivalent selection. Enter hour and minute (AM or PM) by using the buttons on the remote. Consult owner's manual if arrow buttons on remote do not work as on-screen navigation is always a function of how the manufacturer of the VCR has "programmed" the functionality of the VCR. Some VCRs use a plus/minus scheme while others use a up arrow/down arrow selection combined with the OK button or an equivalent button on the remote control. Some VCRs made after 1998 have a very user friendly setup process, walking you thru each menu step by step. The Auto Clock Set feature in some VCRs takes advantage of a signal sent from PBS stations and cable companies which contains the current time of day information. 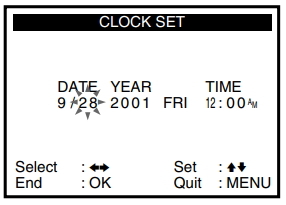 By setting the VCR to "AUTO" clock set, the clock in the VCR can be automatically set to the correct time as soon as it receives the time signal although some VCRs have to be turned off in order to set the clock. You tell the VCR if you are connected to Cable TV or Antenna. Select one or the other. Over-the-Air broadcast TV uses VHF/UHF channels while Cable TV uses more channels. Some VCRs have built-in tuners which will go all the way up to channel 125 for analog Cable TV. You can setup only the channels available to you so that you will not get static when channel surfing on inactive channels. If you get channels 4, 5, 9, 12, 29, 60 for example, you do not want to stop at channels 6, 7, 8, 10, 11, 13 etc. and see snow, you just want to skip inactive channels. This process is automatic in modern VCRs but takes a few minutes to perform as each channel is scanned for a signal and those with a signal are stored. After this process is completed, you can press CHANNEL+ or CHANNEL- on the remote and only go to active channels for your area. To play or record video, insert a video cassette into the rectangular slot in the front of the VCR. Push gently until the cassette is pulled into the machine. The plastic door will close and the VCR will mount the cassette and ready the magnetic tape for playing/recording. A VCR moves the tape in the videocassette over a spinning drum inside the VCR. This drum contains the "heads" which are used to record and playback video. A VCR has buttons on the front panel and the remote control to RECORD, PLAY, PAUSE, STOP, REWIND and FAST FORWARD the tape. Also an EJECT button to remove the cassette from the VCR. VCRs have many moving parts inside which are plastic and metal. Always be patient when operating a VCR because many operations take a moment or two to get started. Many VCRs have "intelligent" rewind and fast forward for example, altering the tape speed slower or faster as required for optimum operation. 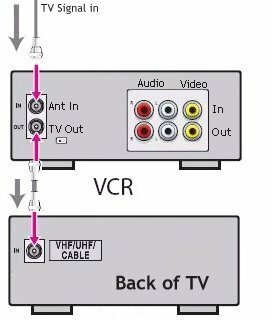 If you just want to watch TV, turn the VCR off and the antenna connection going into the VCR will be "passed thru" to the TV antenna input. This means you have to connect a coaxial cable to the TV VHF input jack in order to "pass thru" the signal. If you use RCA type cables for stereo TVs, you may have to keep the VCR turned on in order to send the stereo signal to the TV. If you do not care about stereo sound then a single coax RG-59 cable will suffice. The VCR/TV switch/button on your remote control allows you to switch back and forth between the VCR source signal and the TV. 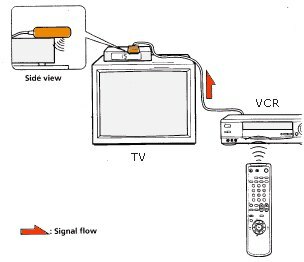 The VCR source signal is either the videocassette or the VCR television antenna/cable signal. Remember the VCR has a television tuner and your TV also has it's own tuner. While you record video and audio, the tape is moving past the "heads" at a specific rate of speed. Most VCRs use "SP" (standard speed) and "SLP" or "EP" (extended speed) for recording. Setting the VCR to "SP" will give the best video results and allows about 2 hours of content on a T-120 video cassette tape. However if you want to maximize your tape usage, a setting of "SLP" will yield more content on the tape, about 6 hours. You sacrifice some quality for the extra content. The VHS video cassette is a plastic housing with two plastic reels inside. The feed reel contains the source magnetic tape and the take-up reel contains the tape after it has been recorded/played. On the back of the cassette is a small square tab of plastic which controls the ability of the VCR to record on the VHS video cassette. If the tab is in place, then the VCR can record on the tape. If the tab is missing, then the VCR cannot record on the tape. Pre-recorded movies will have the tab removed in order to protect the tape from being written over. Removing the tab creates a small hole about the size of your fingernail and this hole prevents the VCR from recording on the tape. Some people later decide to record on the tape and place a small piece of cellophane tape over the hole to again allow recording. When you get your TV programming from cable TV or satellite TV and you want to record a TV show while you are away (unattended or timer recording), you have to be able to select the channel you want to record on the receiver and not the tuner in the VCR. This is because the tuner in the VCR is not able to convert satellite signals or tune scrambled cable TV channels. If you own a VCR which has the capability to send signals to the cable/satellite box, you may be able to change channels on the cable/satellite box when the timer recording needs to take place. This way you can select the proper channel to tune in, and with the proper connections, record the TV show on the VCR. The optional device works like a remote control and plugs into the VCR back panel. The other end of the cable has a small emitter which transmits the codes to the remote sensor on the cable/satellite box. Sony calls their version "cable mouse". Others call it "cable eye" or IR (infra-red) Blaster. The optional Cable Mouse controller (approx. $17.95) allows unattended channel-changing of DIRECTV receivers or most cable TV boxes for timer recordings. CAUTION: Incompatibilities exist with some cable boxes and not all decoders/receivers will work with these devices. Also, as cable TV and satellite receivers evolve, you may find these setups do not work. The newer digital cable and DBS boxes have hard disk video recorders built-in, so this problem can be solved. Cable box on TV with VCR "cable mouse" setup to change channels. VCRs with this feature allow you to view super slow or even frame by frame for examination of video. 4 head VCRs give you an amazingly sharp image allowing you to freeze the action. 60 sec. rewind for T-120 tape. Newer VCRs do not have a knob for tracking control adjustment as this is done automatically. Older VCRs have a manual adjustment control for tracking problems. Adjust left or right for correcting tracking errors. A DISPLAY button on the remote, controls what you see on the TV screen as indicators of status such as channel, tape speed, counter etc. Since the VCR has a tuner and your TV has it's own tuner, you can, with the right hookup, view a TV program on one channel while recording a TV show on another channel. With cable TV as your signal source, you would use a signal splitter to route channels to both the VCR and TV. The VCR has a very powerful capability to not only record a TV program, but do that automatically for you while you are away from home. This is called a timer or timed recording. You setup the information beforehand and the VCR does the rest. The VCR turns itself on at the preset start time, records the channel you selected and stops recording at the time you specify. Use your VCR remote control to enter the VCR on-screen MENU and select the timer section from your list of options. Enter the channel, start time, stop time, date and tape speed for the TV program you want to record. If you want to record the same TV show every day or once a week etc. there are menu selections which will set this up. Weekly [SUN'S~SAT'S]: You can record TV programs on the same channel at the same time every week. Daily [MO ~ FR] : You can record TV programs on the same channel at the same time every day Monday through Friday. To set multiple days, use the 'down arrow button' in the date field until desired choice is selected. If you are not sure the tape is long enough for timer program recording in the SP tape speed, set the recording tape speed to AUTO. Recording starts in the SP tape speed. If the tape length is not long enough, the tape speed automatically changes from SP to SLP. Press MENU again on the remote control to exit and save your changes. Make sure you insert a blank VHS cassette with enough tape to record your selection. Turn the VCR off and it will enter the timer mode. Usually there is an indicator light on the front panel which shows the VCR is in timer mode. This indicator can be a clock symbol or the word "Timer" lighted up on the display. When the date/time occurs, the VCR powers on, starts recording on the cassette tape and stops when the end time occurs. If you selected "one time recording", the entry you setup in the timer section is erased. If you setup a cyclical recording schedule such as every day, your entry will still be setup in the timer section. Note: When recording from a cable TV box or digital satellite receiver, additional considerations are required. Most modern VCRs are "cable ready" meaning they have tuners in them which can tune unscrambled channels from analog cable TV. Also, depending on your hookup configuration, you could set your VCR to channel 3 and record cable TV channels tuned on your cable box and sent to your VCR, since they will be converted by your cable box. This means you could even record scrambled channels that you subscribe to, or digital channels from a digital cable box converter as long as the digital cable box converts them to VHF channel 3 (or 4) output for your standard VCR. Having this type of a setup means that when you select which channel you want to record in the VCR timer section, you need to specify channel 3 (or 4) and make sure your cable box is powered on and set to the correct channel (CNN, TBS, TMC, HBO) at the time of the recording. When using a cable decoder box or Digital Satellite System, make sure the decoder box is on and set to the correct channel for timer recording and enter channel 3 or 4 (which ever you set your TV to), as the channel to record. Your VCR should be connected to your converter box so that the converter box output goes to the VCR input. The converter box can output to channel 3 or 4 such that your VCR antenna input jack can pick up channel 3 or 4. 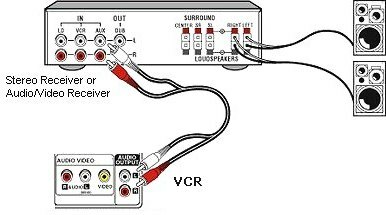 If you use RCA type cables to connect cable box to VCR, set VCR to L1 (Line 1) input. Copying home video from your camcorder to a VHS tape is easy. Just hookup your camcorder to a VCR input jack (yellow video and white audio) then play your camcorder video and record at the same time on the VHS VCR to a cassette. You can hookup your audio to an amplifier instead of your TV and get richer sound from loudspeakers. You have to use RCA type cables (red and white) from the VCR audio OUT to the AUX IN on the stereo receiver or amplifier. 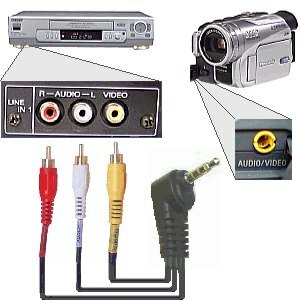 The same for recording from a stereo, only use the VCR audio IN. You could even do a timer recording of a radio show by setting the VCR up to record at a specific time. If your VCR has a MTS stereo tuner, and many do, then you can select SAP instead of stereo sound in order to hear any available audio channel for your current TV program. The audio can be a different language, so you will hear the dialog for the TV program in another language. It depends however on what is available for that program. Some TV shows may have a Spanish audio dialog available or may have nothing at all. You can easily switch back to stereo mode by going into your on-screen MENU options and selecting STEREO sound instead of SAP. VCR formats other than VHS. VHS is not the only format available. For a price, you can get 8mm, MiniDV and S-VHS machines. There are even a few Beta VCRs still around from the 1970s and 1980s. Recording a TV show at slow speed (SLP or EP) on S-VHS gives a better picture than recording on fast speed (SP) on regular VHS. 8mm is popular for camcorders, and there are a few 8mm home VCR's, but it's not big as a home format. It's small and portable, which is nice for camcorders. VHS and 8mm tapes won't fit in each other's machines. So, if you want to play a tape from the other format, you'll have to copy it over to the other type and live with the inevitable loss of quality. With MiniDV today the most popular camcorder format, there are MiniDV machines however the price is high. You have to have a TV capable of displaying the higher resolution or you might as well just convert your MiniDV over to VHS. A faster recording speed gives a better picture. This is because less information has to be recorded onto a particular section of tape. So if picture quality means a lot to you, record on SP for regular VHS. If it really means a lot to you, buy S-VHS or go to DVD. A word about LP. Besides being an obsolete form of recorded medium that was pushed out of the spotlight by compact discs, LP is a middle VCR speed that fits between SP and SLP (or EP). Not too many VCR's offer this speed for recording any more, but most if not all of them will automatically play it back. Still, when all is said and done, most people are perfectly happy with regular VHS, which is by far the most popular and affordable format. Just realize that you can do better if it's important to you. When VCR's first came out their audio quality was about equivalent to AM radio. VHS eventually added stereo sound that gave you two audio channels that were marginally better than AM radio and then, finally, stereo hi-fi audio entered the fray. And the rest is history. Hi-fi audio is the ultimate VHS sound playback system. It isn't quite CD quality but, except for some occasional fluttering you may notice coming from your speakers, you may never notice the difference. Hi-fi works just fine at all tape speeds and will also pick up the Dolby Surround encoding on most of Hollywood's releases. It won't decode the Dolby Surround, but it'll pass it along to your decoder. And if you're going to run the VCR's sound through an audio system, and you can afford it, you should definitely opt for "hi-fi" audio. It isn't as good as digital CD sound, but it's close enough for most occasions. This is especially important if you like watching movies. Even TV programs benefit from hi-fi sound these days; many of them are recorded in Dolby Surround and if your VCR has an MTS stereo tuner (and most do), and if you have a Dolby Surround decoder built into wherever you're plugging the VCR (usually an audio/video receiver or a TV) you'll be able to take advantage of the surround sound. Hi-fi audio is so good you can use your VCR as an audio tape recorder, though it's not nearly as convenient as cassette, DAT (Digital Audio Tape), or Minidisc. And you can't stick the tape into your car stereo, no matter how hard you push it. But for recording TV and watching movies, it's great. Even many low end VCR's today come with MTS stereo tuners. This is a must if you want to take advantage of stereo TV (or bilingual TV) broadcasts. Most major shows are now broadcast in stereo (or even encoded with Dolby Surround - which an MTS tuner will also pass along to your decoder), and while the sound quality isn't as good as a tape or disc, it still beats mono. MTS tuners also have the "SAP" feature (a rather insulting-sounding acronym that merely means "second audio program") that isn't used very much but that allows the broadcaster to send bilingual programming, or programming with an alternate audio track (like a commentary). Most VCR's are also "cable ready," which means they can pull in a multitude of channels. Numbers vary depending on the make and model, but what's important to consider is how many channels you receive in your area (or how many you anticipate will be offered over the life of the VCR - channels that you'll actually use). Some remotes are "unified" or "universal," which means they operate more than just the VCR. They can also be used to control a TV, LD player, cable box, etc. And they sometimes operate other brands of equipment, too, usually by having you enter a code from a list supplied by the manufacturer. It's an easy process and you'll like the results. Don't expect these remotes to replace the other ones, though; they generally only operate the main functions of the other components, which is still a bonus. Before buying, make sure you're comfortable with the remote, with where the buttons are and how the whole thing feels. Make sure you can figure it out! And make sure you think it'll be easy to use in dim lighting. If you want to copy from another VCR or a camcorder, it's nice to have a set of audio and video input jacks on the front of your VCR. AUTO PROGRAM: This is a set up feature you'll probably only use when you first unpack the VCR. It searches all the channels it can receive, automatically programming the ones it gets and ignoring the ones it doesn't. This sets up the "channel up and down" buttons. Every channel is still available from the number keys, even if there's nothing on them. After auto-programming, you should go back and erase the channels it memorized but that you don't want to scan, like scrambled pay TV channels you don't want, the airport listings, or the all commercial channel. Again, these channels will always be there if you have a number pad on the remote: you just won't hit them when you channel surf up or down. AUTO CLOCK SETTING: A quick way of eliminating that flashing "12:00". Some channels broadcast a signal that can set your clock. Make sure the channel you use is in the same time zone as you are! AUTO HEAD CLEANING: Every time you insert a tape, this feature gives the heads a quick scrub. 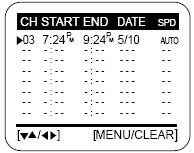 AUTO TRACKING: Sometimes called "digital tracking," this feature is nice when you're playing tapes and you don't know where they've been. It automatically adjusts the VCR's heads for the best playback. It doesn't always work perfectly, but it's pretty good. AUTO START: This is a feature that, when you slip a tape into the VCR, it turns itself on and, if the tape's "write protect tab" (the little plastic tab you remove to prevent the tape from being recorded on again) is broken, starts playing. AUTO REWIND: When the tape reaches its end, the VCR switches into rewind mode and zips it back to the beginning. AUTO SHUTOFF: Auto Shutoff is just what the name says: it shuts off by itself. AUTO EJECT: The VCR spits out the tape when it shuts off. This can be handy when you've left a "write protected" tape in the deck because the next time you walk by the VCR, you have a chance to be warned to put a recording tape back in for your next time shifting session. DIGITAL EFFECTS: These are nothing like those seen in Jurassic Park and other movies. These digital effects, in fact, are merely toys you may never use. The most popular is Picture in Picture, which can let you see two programs simultaneously. You need two picture sources to take advantage of the feature, though, like two tuners, a videocassette and a tuner, etc. Others include trinkets like mosaic or pixelization, which are fun to see once but basically a waste of time and money unless you're planning to use them in your own video productions. FLYING ERASE HEAD: This is a nice feature if you're going to do a lot of editing with your VCR. It's an erase head mounted on the spinning drum with the video (and hi-fi audio) heads. It makes for clean, sparkle-free edits. If you don't plan on doing a lot of editing, pass this feature by: it adds to the price. INDEX SEARCH: This is really nice. The VCR puts a mark on the tape each time it begins recording, and later you can have the machine find these marks either by number or by scanning forward or backwards. It makes finding the beginning of your recording programs easy. It certainly beats scanning back and forth randomly! JOG-SHUTTLE: A little wheel or knob on your VCR and/or remote that lets you scan at various speeds, from frame by frame to high speed. VIDEO NOISE REDUCTION: A circuit that shovels snow from your picture. Does a better job than not having it, but another way to reduce video noise is to buy a laserdisc player. A feature than lets you skip over commercials during playback. Higher-end models breeze through ads automatically, while this is a manual function on less expensive VCRs. Movie Advance automatically skips ahead to the beginning of the feature on pre-recorded tapes. VCR Plus+ is a programming tool that uses the numerical codes published in most TV guides. You simply enter this code, and the VCR knows that you want to tape your specific TV program, on Tuesday at 9 PM. VCR+ Silver and VCR+ Gold are easier to set up; just punch in your zip code, and the VCR automatically maps your cable network's channels. A jog/shuttle wheel allows you to advance frame by frame during playback. This is a great tool for video editing, and sports fans love being able to use their own slow motion. Some VCRs have a jog/shuttle wheel on the VCR unit, while more expensive models have one on the remote as well. Flying erase heads are great for editing, as they give you crisp edit points. If you're not going to do any editing, skip this feature, as it adds to the cost of the unit. A universal remote can operate other components, such as a TV, DVD player or even another VCR. If you record a lot of TV shows, you'll value an index feature. When you pop in a tape, you'll get a listing of contents; select an item and the VCR will take you to the right spot. Front input jacks will make your life easier if you download frequently from a camcorder; you won't have to fumble around the back of the unit to get hooked up. Most S-VHS VCRs have a feature called ET, or expansion technology. This lets you record S-VHS quality on standard VHS tapes instead of more expensive S-VHS tapes. Almost all VCRs now have four heads, automatically set the clock to the correct time and use onscreen programming. Also, most VCRs have automatic tracking, although some have a manual override. Many newer VCR models can deal with the ever-growing number of cable TV channels and are compatible with digital cable television. But if you plan to run your expanded cable TV through the VCR, it's worth checking this out before you buy. There are problems programming VCRs through cable boxes, and since there are so many flavors of cable TV, you should be prepared for some issues; often you may need to purchase a "cable eye" or "cable mouse" to control your cable box. Regular television broadcasts deliver about 330 lines of horizontal resolution; VHS VCRs are capable of about 240 lines. This means that standard VHS VCRs will not give you quite as crisp a picture as a broadcast will. Super VHS, on the other hand, can put out 400 lines of resolution, so taped TV should look like the real thing. Satellite TV looks especially good on S-VHS, with all 400 lines of DirecTV resolution coming through crisp and clear. S-VHS VCRs are the better choice for picture quality, but experts say they have some drawbacks. First of all, S-VHS VCRs are more expensive. Second, S-VHS recordings aren't compatible with most VHS VCRs. This means if you tape a show in S-VHS format and pass it on to a friend, your friend's standard VHS VCR may not be able to play it. Of course, you can turn off the S-VHS feature and record in regular VHS mode, but then you're not using what you paid for. The most common causes of damage to video cassettes are improper storage and improper loading into a videocassette recorder (VCR). 1. Always store a VHS videocassette upright, like a book, away from anything magnetic or that might emit a magnetic field. This includes television sets, speakers, computer monitors, telephones, microwave ovens, and airport security gates. NEVER lay a videocassette flat on a television set , speaker, or computer monitor. 2. Protect videos from extreme temperatures. Do not leave videos for extended periods in automobiles. Videos can be damaged if played before reaching room temperature-- they may stretch if hot or easily break if cold. Allow cold videos to lie unpacked for at least two hours, to reach room temperature before playing. 3. Be sure that your VHS format VCR is in clean condition. Depending on usage, clean the magnetic heads periodically. 4. Load the video into the VCR gently, and in the direction of the arrow embossed on the cassette case. Usually, the VCR will do the work once the cassette is inserted. 5. Find the VCR's tracking dial so that the video's playback can be adjusted, if required. The tracking adjustment is usually on the bottom of the front panel of the VCR, as a small wheel or knob labeled "Tracking." If you experience any "snow" or distortion on your TV screen, or if the audio sounds garbled: simply adjust the tracking both ways, unit the picture and sound become clear. Of course, this procedure will only affect and correct a tracking problem. 6. To avoid tape damage, use an "image pause" feature only when necessary. Never pause more than 10 to 20 seconds, maximum.